Brighten up your Easter decorating, indoors or outside with this colorful string of bunny lights. 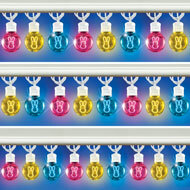 Each of the pink, yellow and blue globes feature a bunny inside that shines with white light! The string includes 25 LED lights on a 200" long cord. Plastic and wire. 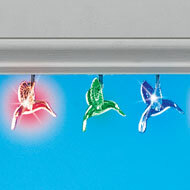 These spectacular solarpowered hummingbird lights brighten up your outdoor décor with colorchanging light! Use this string of 20 hummingbirds anywhere in your yard – it's perfect for shrubs, gates and more! Includes 1"AA" rechargeable battery. Plastic. Hummingbirds are 2" x 1 1/2", total length is over 18feet long. 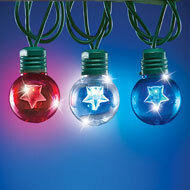 This fun and festive light string features red, white and blue globe lights with stars inside. A great way to let your patriotic spirit shine all season long, it plugs into an AC outlet and includes endtoend connectors to string multiple sets together. String includes 25 lights. Plastic. 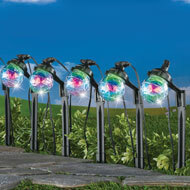 205"L.
Add an instant touch of sparkle and shine anywhere in your yard or garden with these solarpowered LED lights! Each string includes lights that shine automatically at night, and you can choose steadyon or flashing modes. Solar panel stakes easily into the ground. Each includes 1 "AA" battery and on/off button. Plastic. Available in White, Blue or Multicolor. Give your home a dazzling light display with these exciting festive icicle lights. 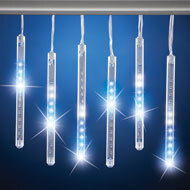 Set includes 6 icicles, each with 11 LED lights that travel up and down with bright blue light. Req. 3 "AA" batteries (sold separately). Plastic. Each icicle is 8 1/2"H. Total string is 61"L.
Decorate your patio or garden with this string of elegant color changing, raindropshaped solar lights. It features 20 lights that hang along a solarpowered string that's over 9feet long. Perfect for decorating a tree, patio umbrella and more! Includes 2 "AA" rechargeable batteries. Plastic. 111"L.
Flame Tip Halloween String Lights, 12 Ft.
Add these spooky flamestyled lights to any Halloween display, indoors or out for a fun and festive look! The string features 35 orange colored, flame shaped bulbs, and endto end connectors allow you to use multiple strings for the ultimate display! Glass, metal and plastic. String is 12ft. long, bulbs measure 3/4"Dia. 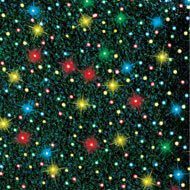 x 1 1/2"H.
These festive lights add holiday color indoors or outside! 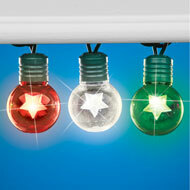 Red, green and white globes feature stars inside that shine with white light! The string of 25 LED lights include endtoend connectors so you can string multiple sets together. Plastic. Includes 25 lights on a 17foot long cord. 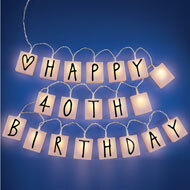 Solar light string includes 54 letters so you can create your own customized messages! 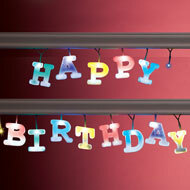 The clear letters clip onto the multicolored light string that lights up automatically at night. Great for birthdays, holidays and other celebrations! Includes 1 "AA" rechargeable battery. Plastic. Each letter is 2 1/4"H. String length is 74"L.
Decorate your patio or garden with this colorful string of festive, raindropshaped solar lights. 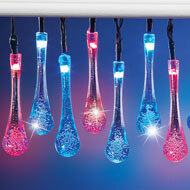 It features 20 red and blue lights that hang along a solarpowered string that's 15ft long. Perfect for decorating a tree, patio umbrella and more! Includes solar panel and 1 "AAA" rechargeable battery. Plastic. 180"L with 8 1/2"H solar stake. 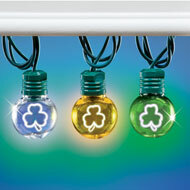 These festive lights add the St. Pat's spirit indoors or outside! The green, clear and yellow globes have shamrocks inside that sparkle and shine with green light! 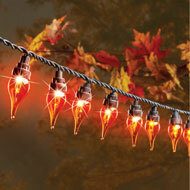 The string of 25 LED lights is a great addition to your home, indoors or outside. Plugs into AC outlet. Has endtoend connectors. Plastic. Includes 25 lights on a 16 foot long cord. 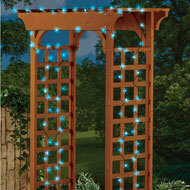 These colorful ladybugs are gathered along a string that lights up with warm white LED lights. The batteryoperated lights can be used anywhere indoors or outside for a unique and colorful display. Req. 3 "AA" batteries (sold separately). Plastic. 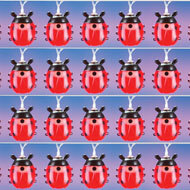 Set includes 20 ladybugs on an 81"L string. Display your custom messages indoors or outside in a covered environment. Set includes 20 light up boxes on a string with individual letters, numbers, symbols and shapes, so you can create your own customized messages! Each box has it's own bright white light. An on/off switch is located on the battery box. Requires 3 "AA" batteries (sold separately). Plastic. Each letter is 2 1/4"H x 2"W. String length is approximately 77"L.
Accent your landscaping, line a pathway or decorate a porch or deck at night. Rope light is 16ft. 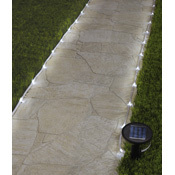 long, has 50 LED lights and is solarpowered so it's easy to install and needs no extra wiring. Incl. 1 "AA" rechargeable battery. Plastic. 16ft. long. Color available in Multicolor or Blue. Accent your landscaping, line a pathway or decorate a porch or deck at night. Rope light measures 20ft. 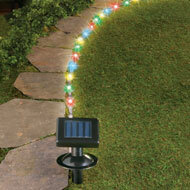 long, has 30 lights and is solarpowered so its easy to install and needs no extra wiring. Includes a solarrecharging "AA" battery. Plastic. 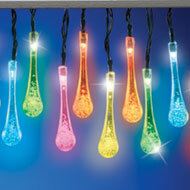 Measures 240"L.
Add light and color throughout your yard with these unique multicolor bulb lights. 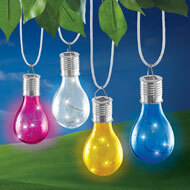 The set includes a pink, white, blue and yellow light bulbs. Each solarpowered bulb has 5 LED lights inside that automatically shine at night. Each includes 1 button cell battery and a hook for hanging. Plastic and PVC. 3"Dia. 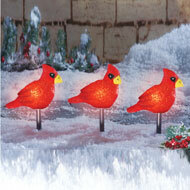 x 6"H.
This trio of bright and cheerful cardinals will make a festive addition to your outdoor seasonal décor. The red cardinals stake easily in the ground and shine at night. Plugs into an AC outlet and has endtoend connectors for multiple strings. EVA and plastic. Each cardinal is 7 3/4"L x 3 1/4"W x 16 1/2"H. 12" long cord.